Yesterday, I set out on an exploratory hike in our extended backyard (oak woodland/chaparral green space adjacent to our home) to learn more about the very nastyparasitic plant Chaparral Dodder. I had hoped to get some images of the dodder flower but it was not yet flowering. The dodder was just strangling the flowering chaparral that it was hosting on. I was cautious to not get too close in fear that the dodder tenicles would reach out and capture me. More on This is Not Your Father’s Dodder later. On returning home I took a trail where I had earlier seen Yucca in bloom in hopes of getting some photos of the yucca flowers and possibly the yucca weevil but the yucca had already reached full bloom and were in decline. 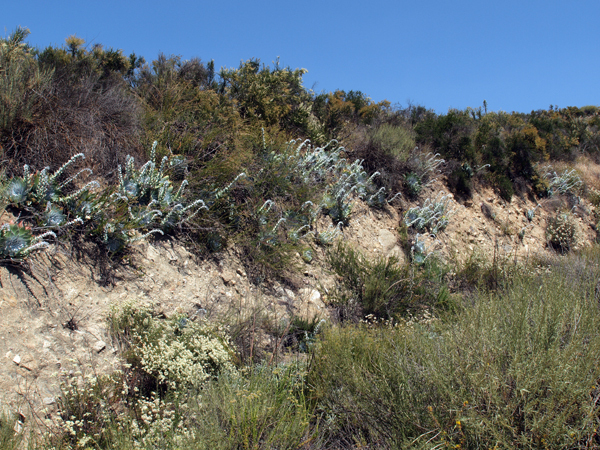 Approaching the area I noticed several silvery protrusions extending from the side of a steep hill. 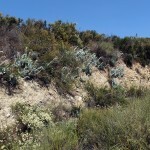 When I reached the area I was astounded to see a beautiful succulent plant from which the silvery protrusions were arising. My first thought was, “here is my starter succulent!” I am planning putting in a succulent garden in our front yard to reduce the sod area and to provide a natural border around some already drought resistent and native plantings. I continued down the trail and couldn’t believe what I was seeing. 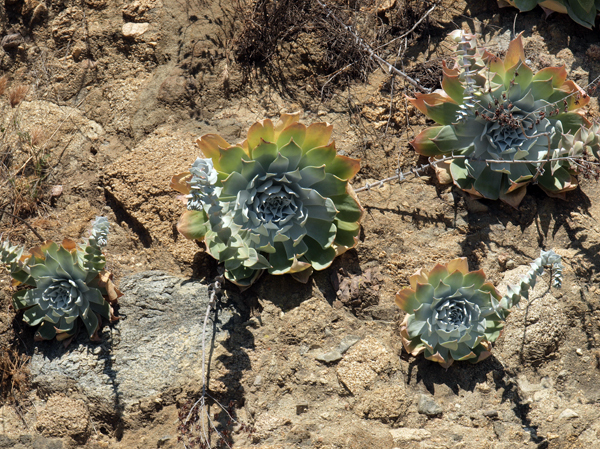 There were many of these succulent plants all along the trail clinging to the steep wall. I was curious to know what these amazing plants were however I could find no reference to the succulent plants from the guides in my library. Several years ago I disposed of my copy of, A California Flora by Munz when I was culling out my library in PA. At the time I was certain that I would probably not return to California, so it was recycled. 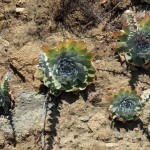 A California Flora was(is?) “the” botanical identification guide for the plants of California – no illustrations, no photos – it’s just a text key, a very thick key indeed. Then I thought, “well if I did have Munz, how long would it take me to key the succulent plant out?” Realizing that keying out a succulent plant using Munz would have been quite simple – since there aren’t that many native succulents! 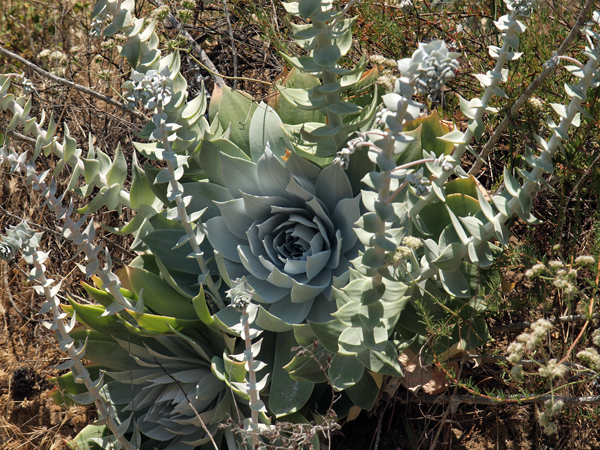 Today, looking through a book I had missed yesterday, Introduction to the Plant Life of Southern California I found squezzed between the cacti section and the chaparral section one page on SUCCULENTS, and there it was, Dudleya pulverulenta (Chalk Dudleya) was screaming at me! From there the information flowed as Google and Bing took over. 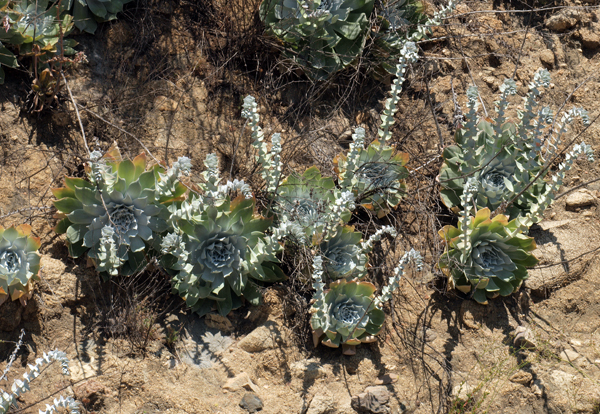 A great article on Dudleya by Judy Wigand for the San Diego Union-Tribune is available here. 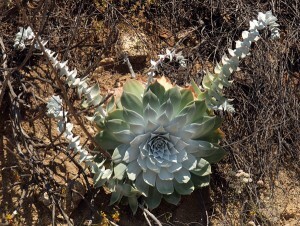 I learned from Judy’s article that the Dudleya is a protected species and is becoming scarce from loss of habitat loss. It is however available in plant nurserys, so I shall enjoy the Dudleya in its natural state and purchase my starter Dudleya from a nursery. 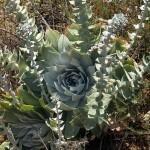 Of course if a Dudleya were to follow me home that would be another thing. 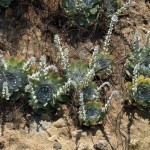 I am anxious to observe and photograph the red flowers of the blooming Dudleya which will soon appear. COMING SOON – This is Not Your Father’s Dodder! This entry was posted on Friday, May 21st, 2010 at 8:46 am	and is filed under Plants. You can follow any responses to this entry through the RSS 2.0 feed. You can leave a response, or trackback from your own site.